What makes a stay at Blackberry Inn special? Some say its our 11 light and graciously appointed guest rooms, decorated in Victorian splendor, all with private baths and thoughtful amenities, some with wood burning fireplaces and whirlpool tubs. Others love our great gourmet breakfasts with specialties like Apricot Crunch Toast, Brie and Pesto Souffle or Blintzes with Blackberry Sauce, served in the formal dinning room or al fresco in the courtyard. Still others enjoy our Victorian Bed and Breakfast, with its graceful airy parlors, parquet floors, tin ceilings and ornate plaster mouldings. We're the only home in Maine featured in Daughters of Painted Ladies: America's Resplendent Victorians. Fully sprinklered for your safety, you are sure to appreciate the welcoming atmosphere at Blackberry Inn. 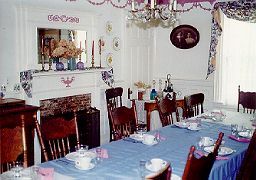 Come visit Camden's Victorian Beb & Breakfast and see why the Miami Herald called us " delightful." Rates: $90 through $155 depending on room and season. Call for current rates. 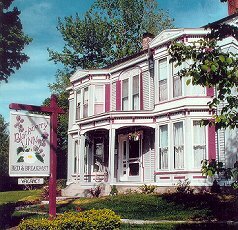 Blackberry Inn is "one of the outstanding reasons to visit New England." Editors' Pick in the 1996 Yankee Magazine "Travel Guide to New England." THE REGISTER Special - Between November and April, stay three nights or more and we'll pay the lodging tax. A 7% discount.